Sur ce stand dédié à la présentation du Weta 4.4, nous serons en mesure de prendre également vos commandes à prix spécial Nautic!!! Et de garantir en fonction des stocks des livraisons avant Noel!! Paris Voile are new Weta dealers for France and they have a lot of experience with not only multihulls but many other sailing products on the market including Hobie and Laser. Both Pierre-Jean and Thomas from Paris Voile along with members of Weta Classe France will be at the Nautic to discuss the Weta with you. 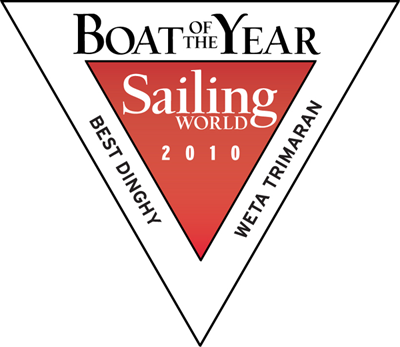 The new generation Weta trimaran will be exhibited at the Nautic Boat Show in Paris opening on December 8 through to December 16. This show is one of Europe’s premier events with a huge range of boats on display. Paris Voile is excited to have the Weta on display at this show as it is the premier beach multihull unrivalled in versatility, quality and value for such a superb proven composite handcrafted product. With over 1200 on the market, the Weta, with it’s carbon spars and foam sandwich fibreglass construction – it is rigid and light weight, out performing other rotomolded products. Three quality hand crafted hulls for the price of a monohull is excellent value!